I’ve heard from a friend that Saigon Grill in north Durham is a pretty authentic Vietnamese restaurant, so we gave it a try today for lunch. The menu featured pretty tempting things like frog legs and rabbit, both of which I wanted to try, but since I wanted to compare its food to other Vietnamese restaurants in the area, I decided to go with the “bun” – vermicelli noodles with grilled pork, shrimp, and egg rolls, which is what I usually order. The grilled pork was the best part of the entire bowl – the flavor was done just right (not too salty, not too bland), it was very juicy and not dry at all. The grilled shrimp was also pretty good. The egg rolls weren’t the best – I thought the dough was a bit overfried, and there wasn’t enough filling, and the vermicelli noodles lacked chewiness. However, their “special fish sauce” was one of the best I’ve had: it didn’t have the strong “fishy” smell that most other restaurants’ fish sauce has, and they added some hot sauce, which is always given a plus in my book. Overall, I enjoyed my meal – it was good, and it was cheap. Compared to Pho 9N9, another popular Vietnamese restaurant, I would say that Saigon Grill has better grilled pork and fish sauce, whereas Pho 9N9’s noodles are better. So it depends on what you like to eat, I suppose. 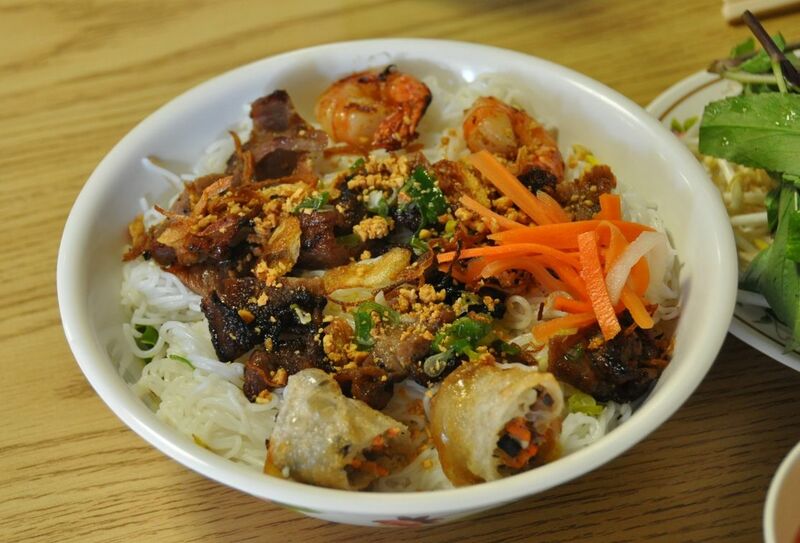 If you like pho, Pho 9N9 would probably be a better choice, whereas if you’re more interested in the rice plates or vermicelli, like me, I’d choose Saigon Grill. The fish sauce and grilled pork have won me over. – Don’t miss this if you like Vietnamese. Make sure to try their grilled pork or shrimp, though, and preferably with rice than noodles.